Could it be?? The Perfect Sparkling Gift? | the wine snob. Could it be?? The Perfect Sparkling Gift? The answer, of course, is YES! It’s perfect. The Mumm Brut Prestige (NV, Napa Valley) really had me at “Hello.” The bottle looks sophisticated and well designed- Good Gift Reason #1. It tastes delicious- Good Gift Reason #2. It’s #48 on Wine Spectator’s Top 100 Wines of 2010- Good Gift Reason #3. Soooo… I’m thinking that’s all you really need to know. No? Well, okay, I’ll tell you a little bit more about it, but only because I like you. Aight, so the Brut Prestige is an assemblage of primarily Pinot Noir and Chardonnay. In true Napa-sparkling style, it strikes a near-perfect balance of gorgeous, warm, sunny fruit characteristics and a lively, refreshing, quenching acidity. The website states that it is aged in *mostly* stainless steel- there are hints of yeasty spice and vanilla, which suggest a small amount of oak- but whatever the amount, doggone it if it ain’t just right! The rest of the nose is pear, apple, fresh white flowers, apricot and melon. What I love BEST about it (besides the fact that it’s reasonably priced) is the mouthfeel- it has that delicate “lift” that a sparkling wine can have- it feels sort of like an air-bubble in your mouth for a second, and the mousse is very fine, but not so fine that you can’t find the bubbles. Cuz you want to know where da bubbles at when you’re drinking sparkling wine! 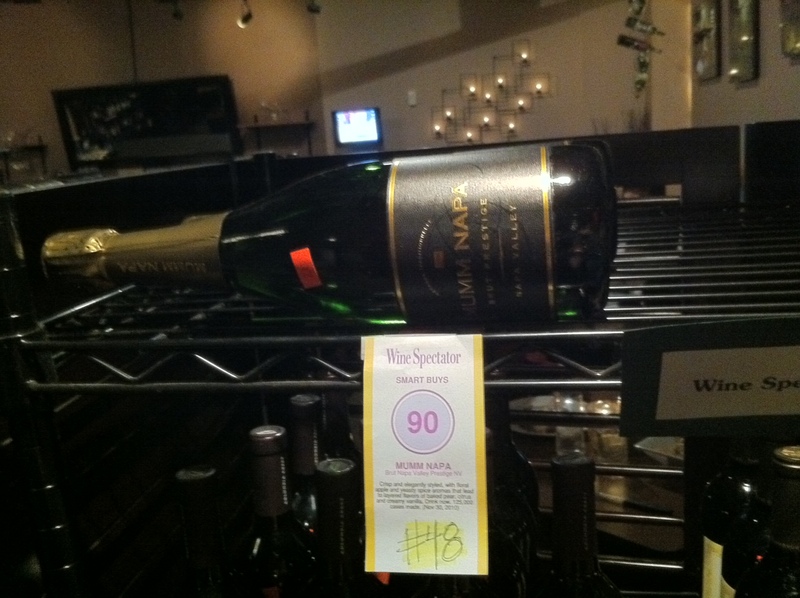 Here it is on our Top 100 Shelf at Cellar on Greene, flaunting it’s cool little 90-point rating. Sooo… let’s see if we can find a celebrity to liken this wine to… Awwww man- I’m bringing out the big guns for this one! So this wine is classy, elegant, and most importatly- has never, and probably will never, go out of style. Even if you’re not in the mood for wine drinking, it’s still bound to brighten your day. Sometimes you probably forget how good it is, until you pop a bottle one Tuesday for no reason and are reminded- WOW- it’s been this good all along and has never faltered not even for a second! Can you guess it?? 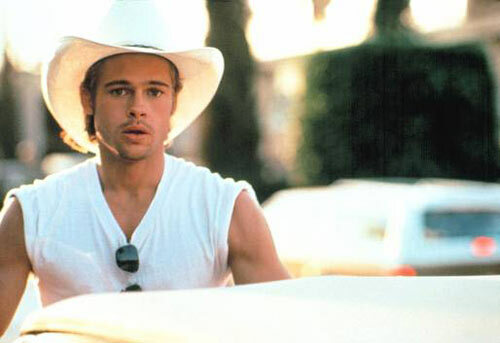 BRAD PITT!! Yes, that’s right folks. Did you forget about Brad Pitt? You might have, since he’s so busy with the kids nowadays, and he has the beard sometimes which is a little distracting. And he’s basically started a second career as a philanthropist and spends a lot of time on that. But… do you remember Thelma & Louise? I DO!! I love him in that movie. That might be my favorite cute boy movie of all time. And by that I mean, you watch it just to see the scene with the hairdryer one.more.time. So in a nutshell, the Mumm and Brad are one because they are timeless and perfect for any occasion. So, the last thing I need to mention is that the Mumm can be had for the cool price of 20 bucks! Good Gift Reason #4- twenty bucks is the ideal amount of money to spend on a gift, in my humble opinion. Stop in to Cellar and mention this post when you purchase the Mumm and I will also give you a pretty sparkly wine bag to put it in, thus negating the need for you to wrap it! So that should wrap things up for this edition. All in all it’s been a good writing experience, given that I got to stop halfway through and Google pictures of Brad Pitt. Just what I needed tonight, and hopefully it was what you needed, too! Mumm Brut prestige will never taste quite the same to me since every sip will make me think of Brad. gee, thanks. now my wife on the other hand will probably drink this every night and every day. all of you women are sick.